Home › Our News › Augmented and Virtual Reality - Where is it going? In the past, many have attempted to crack into the Virtual Reality (VR) market, but with very limited success, especially when compared to the progress the industry has made in the last few years. A notable example is Nintendo’s release of their VR headset, the ‘Virtual Boy’, which had limited success with its arcade graphics, eye-smoldering 384 x 224 resolution screens and 128kb of RAM. Recently, Nintendo (along with their partners in the venture, mainly developer Niantec) finally did crack the market with the release of the popular mobile game, Pokemon GO. The ‘Augmented Reality Unity Engine’ (AR-based) game used 3D model of Pokemon superimposed over a feed from the user's phone camera to bring Pokemon into the real world. This made people wake up to the fact that VR and AR are definitely within reach and it's are going to change things for people in many different areas of their lives. What is the obsession with VR and AR technology? Aside from the fact that we yearn to have an environment like the matrix to frolic in - even though we probably already live in a computer simulation - I think we like VR and AR for the same reasons that we enjoy watching movies, looking at art work, travelling to faraway places, and playing video games; we like to experience things that we don’t usually get to experience every day. Even though technology has attempted to do this in the past, it's new in that hardware and software exists that allows us to experience something that looks closer to reality. VR can make you feel as if you are really there and AR can allow you to do things in your environment that you usually could not, such as catch Pokemon. It’s about experiencing things, as a human life is about experiences. The key difference between AR and VR is that VR attempts to completely immerse you in a virtual world, whereas AR takes sounds and images and augments them into the world around you. They are similar in that they can both use similar interaction concepts from users, as well as 3D models and user interface components. They are different in that VR relies on a world fashioned by the developer, and AR relies on the world around you. They can both be used to achieve similar goals. The first time I used VR was via the Samsung Gear, a headset that plugs into Galaxy S6 and S7 handsets. It was surreal and emotional for me to see 360° panoramic photos of archaeological sites in Egypt. Particularly, seeing the temple of Karnak in Luxor (a place that was at the time recently the victim of a bombing attack) in close to real life was unbelievable. You can see some of these pictures on the EgyptVR Facebook page. 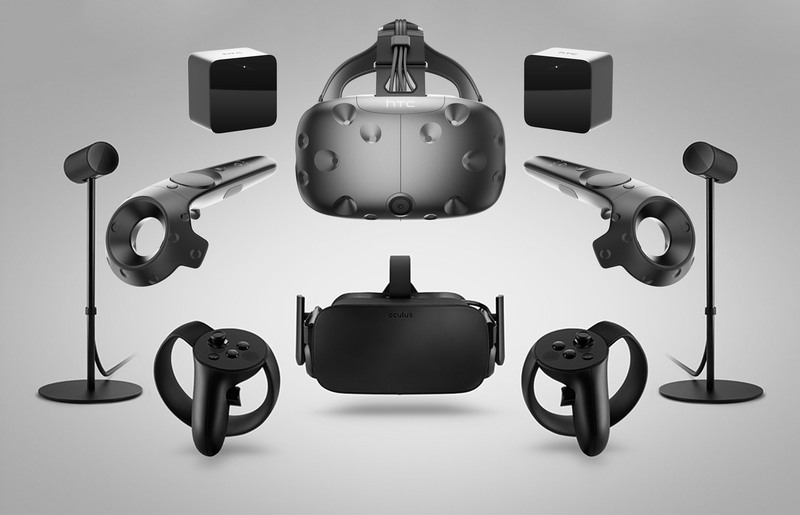 The complete HTC Vive kit. Another great VR project is a virtual ecosystem simulator called ECO, where you build an ecosystem and learn about the environment in VR. These examples highlight another major use for this technology, which is the ability to allow us to learn. Instead of learning just from a book or pictures we are able to be there experience things like never before. We are also given hope that even after we destroy some of the nice things in the world, others will still be able to experience them in one way or another. As the technology develops I’m sure we will see many great things built with AR and that people will push hardware to the limits to achieve them. As vision simulation is perfected, there are other aspects that can still use work, such as touch, smell, and movement simulation. 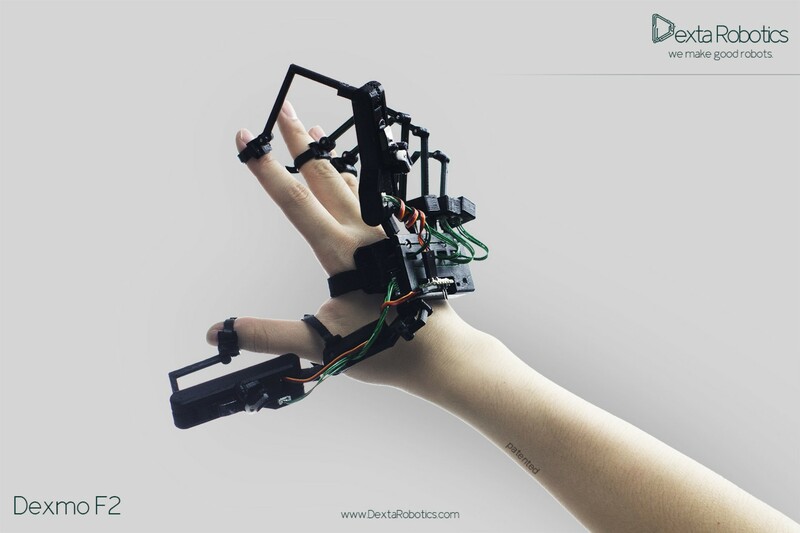 One company on the fringe of such improvements is Dextra Robotics, who are currently working on a glove that provides feedback to the user’s hands. As developers scramble to get as many games and experiences as possible out into the world, we can’t forget the other side of VR; it’s use in business and communication. A big contributor to this will be Microsoft's AR headset, the HoloLens. The HoloLens will allow users to see the world much like they can via AR applications on mobile, but using a view encompassing headset. This video from Microsoft Research shows one possible application as a conferencing technology. VR technology could also be used for other things such as shopping, where you could augment paintings directly onto your wall at home, or play games directly on your coffee table. Imagine a science teacher showing students how a volcano works using a 3D cross section and animated model, right in the middle of the classroom, or students using a 3D model of the human body instead of real life cadavers. For new technologies comes new ways of thinking, and this is probably where the technology will need to look next for further improvement. I don’t think we can expect to interact with the software of the future in the same way that we are now. Whether it's voice activation, or new types of hand commands and gestures, or even via our thoughts (….doubtful you say? Think about what people thought of VR and AR less than 10 years ago), the way in which we communicate with machines, and each other, is on the cusp of change.